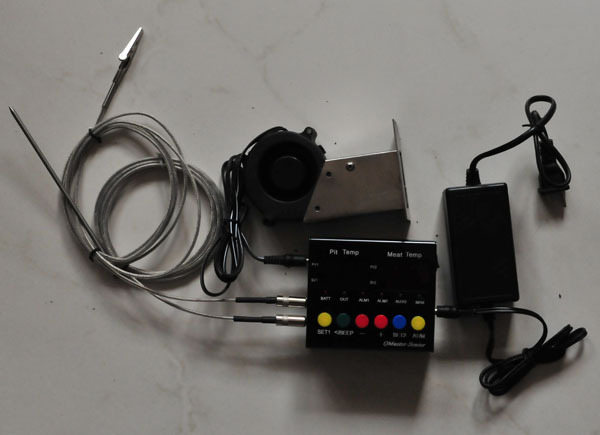 Basic Guideline: the fan will be controlled by pit Temp. first. There are 4 pit temperature stages. Whenever the meat temperature reachs to P1, the Meat temperature will take over control of fan. There are 4 meat temperature stages. Press "SET1", PV1 window will show "SC ,TC,AL,AH,", press "< +-" to set data in SV Window. Press "SET2", PV2 window will show "P1,T1,P2,T2,P3,t3,P4,T4,P5", press "< +-" to set data in SV Window. Setting Maximum Fan Speed (HDC) in %. When you set SC=0, the following Phase will be ignored. When turn off/on power, it will continue last mode. Say if you set smoking time for 8 hours, if any power interrupt, when power is back, it will continue. When you press "AT/M", it will forget auto session.